Premier Truck Parts, Inc. (“Premier” or the “Company”) is a remanufacturer of heavy-duty truck drive train components, and supplier of new parts to the trucking industry. The principals of MelCap Partners, LLC (“MelCap”), acting in the capacity of registered agents for M&A Securities Group, Inc., successfully represented Premier Truck Parts in the sale of a significant equity interest in the business. MelCap implemented a multi-step approach designed to help the Company and its Shareholders reach their stated goals and objectives. 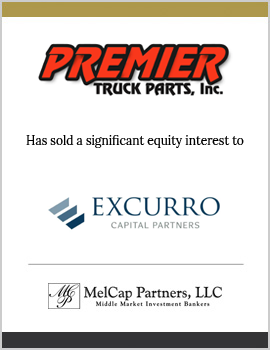 Through this process, MelCap identified Excurro Capital Partners as the most logical equity partner for Premier Truck Parts and its other shareholder.